Low- and middle-income Singaporeans are not able to save and retire in Singapore. Even though taxes are higher in the Nordic countries, because wages are also a lot higher, low-income citizens in the Nordic countries would still be able to save and retire. Singaporeans have been often told that tax rates are low in Singapore and thus more cannot be done for Singaporeans. But for the poor in Singapore, are they really paying the lowest taxes? And also, are they “less badly off than if you were poor nearly anywhere else in the world,” as the Singapore prime minister had claimed? Let’s take a look. In this article, we will compare how much citizens in each of these countries have left to save, after taxes and spending on their basic needs. In December last year, we wrote an article comparing the wages of low-wage workers in Singapore with that of the Nordic countries. We looked specifically at the wages of cleaners and bus drivers, as quoted by Professor Tommy Koh. Today, we will look at their wages in more detail. In Chart 1, you can see the annual wages of cleaners in Singapore (not inclusive of bonuses), as compared with that of the Nordic countries. 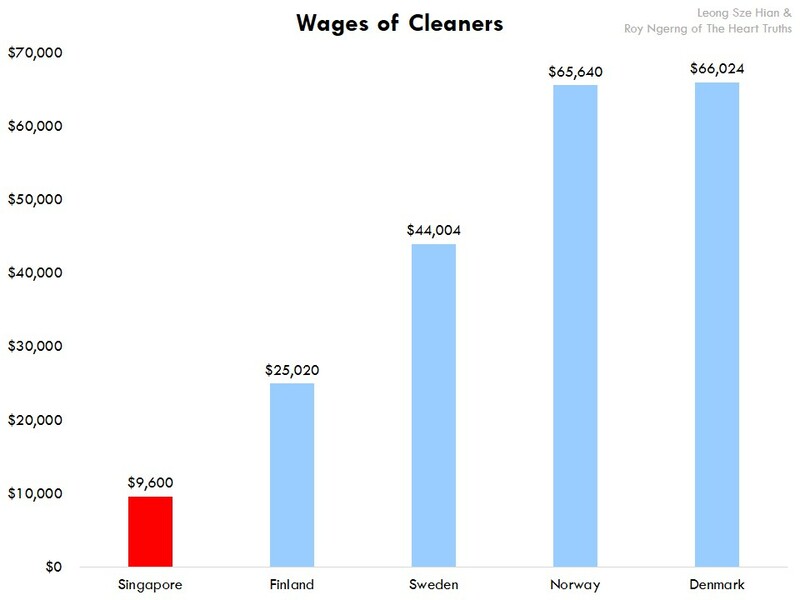 You can see that the cleaners in Singapore earn the lowest wages, as compared to the Nordic countries. 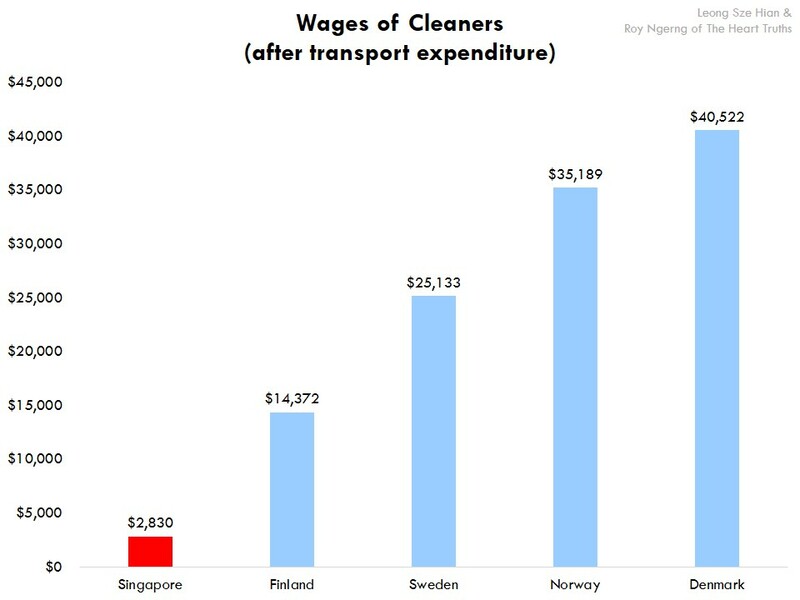 In fact, the cleaners in Norway earn nearly 7 times what Singaporeans earn. We have also been told that taxes in the Nordic countries are one of the highest in the world. Actually, for the poor in Singapore, and not only that, but also in Norway and as well, they are not required to pay taxes. For the poor in Finland, they have to pay about 17.25%, and in Sweden and Denmark, they would have to pay about 30% of their wages into tax. In Chart 2, you will see how much wages cleaners have after tax in each of the countries. 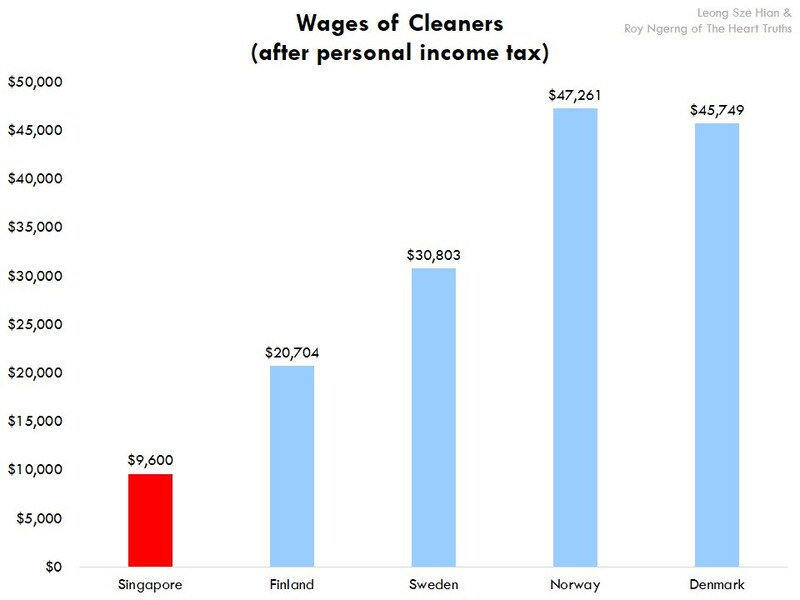 You can see that the wages of the cleaners in the Nordic countries are still higher than Singapore, even after tax deduction. We have been told that because tax is high in the Nordic countries, their wages get reduced significantly. However, you can see that this is not true. In fact, they still have higher wages than Singaporeans. But what about after deducting for Central Provident Fund (CPF), or social security? This is where it gets interesting. Low-wage workers in Singapore might pay one of the lowest taxes in the world, but we actually pay the highest CPF, or social security rate in the world – we pay 20%, as compared to 5.15% in Finland, 7% in Sweden and 7.8% in Norway. People in Denmark pay a flat rate of $250. But actually, we are paying 36% because if employers don’t have to contribute the employer CPF contribution of 16%, Singaporeans would arguably be paid higher wages. For the purpose of this article, we will use 20% for the analysis. After deducting for CPF/social security, you can see Singapore still have the lowest wages. For Sweden, the social security rate is already included under the personal income tax rate in Chart 2 (Chart 3)! Next, let’s take a look at spending on the basic necessities – food, transport, housing, healthcare and education. For food, we worked with the assumption that a low-wage worker in Singapore would spend only $10 on food everyday, which would make an annual $3,650 on food. According to Numbeo, food prices are 11.6% more expensive in Sweden than in Singapore, 12.1% more expensive in Finland, 16.6% more expensive in Denmark and 55% more expensive in Norway. Thus food prices in the Nordic countries would be $4,074, $4,092, $4,256 and $5,657 respectively. After deducting for expenditure for food, Chart 4 would show how much a cleaner would have left. Very interestingly, the gap widens further again. Even though food in the Nordic countries is more expensive, after spending on food, the Norwegians would now have more than 9 times what Singaporeans would have. 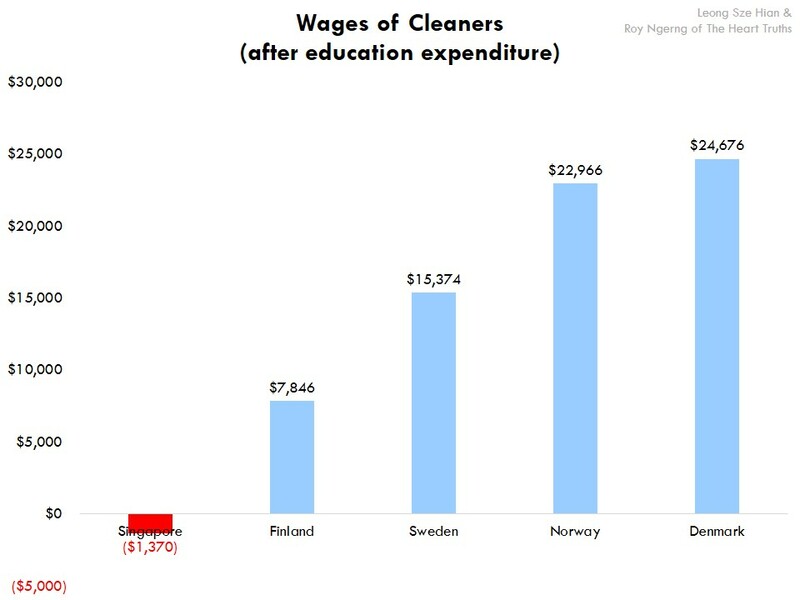 This is because in Norway, cleaners have much a much higher starting wage, which would give them a higher purchasing power. Next, we look at transport. For a Singaporean, we assume that he/she spends $100 for travel every month or $1,200 annually. In the Nordic countries, citizens are able to travel on travel passes, which offer huge discounts and subsidies for travel. Thus the Danish would need to spend only $722, the Finns $951, the Swedes $1,597 and the Norwegians $1,295 – pretty much the same as how much Singaporeans would spend. Chart 5 shows you how much citizens in each country after deducting for transport costs. This time, again the gap widens – the Norwegians have 12 times more what a Singaporean would have! Do you see the trend here? With every deduction, the Singaporeans earns significantly lesser and lesser, comparatively. Why is this the case? 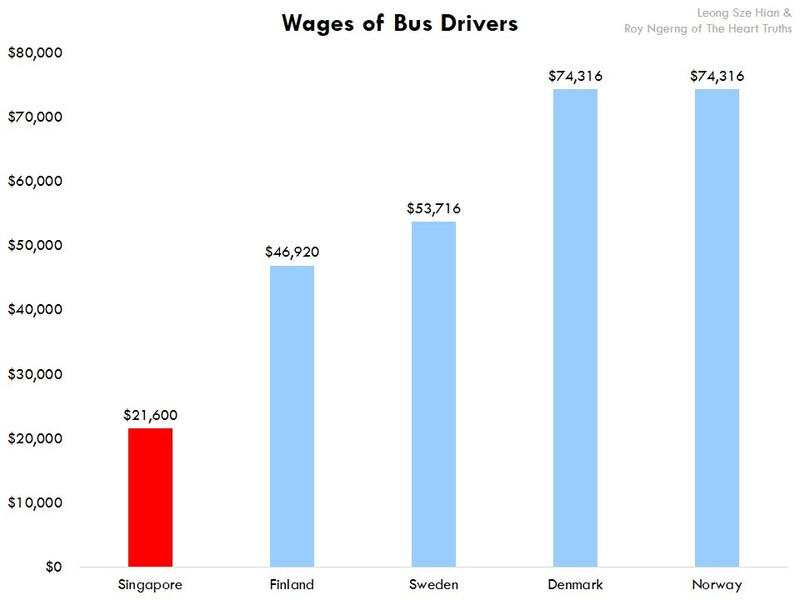 First, Singaporeans earn a much lower wage than people in the Nordic countries. Second, even though costs might be more expensive in the Nordic countries or in some instances the same as Singapore, but because they have higher wages, the costs take up a much lower proportion of their wages. We next move on to housing. How much will Singaporeans have after deducting for housing? For the lowest-income earners in Singapore, they would be able to rent public flats from the Housing Development Board (HDB), for between $26 to $275. For this discussion, we will use the midway point of about $100 for comparison. A person would thus need to pay $1,200 in rental in a year. Similarly, for the lower-income who buys a 2-room HDB BTO flat for about $100,000, with $20,000 CPF, the maximum housing grant of $60,000 and a 25-year HDB loan of $20,000, the monthly mortgage repayment is $91. However, how many people who buy a 2-room flat actually qualified for the housing grants, and for those who could qualify, how much was the quantum of the grant? How many Singaporeans actually qualified for the maximum $60,000 grant, which the HDB had shown in illustrations to show that HDB flats are affordable? For the Nordic countries, according to the OECD Better Life Index, the Norwegians would spend 18% of their income on housing, the Swedes 21%, Finns 22% and Danish 24%. Chart 6 shows how much they have after deducting for housing. Singaporeans will only have $1,630 left in one year, after spending for housing. Meanwhile, the gap between the Norwegians and Singaporeans widens further – the Norwegians would have nearly 14 times what Singaporeans would have left. But there is still healthcare and education! Moving on to health, according to Worker’s Party Gerald Giam, in 2012, there were “over 2,400 MediShield policyholders made co-payments of over $10,000 each”. For this illustration, we will look at what happens if we assume that a Singaporean would have to pay $1,000 cash for his medical bills (assuming that his Medisave is enough to pay for most of his co-payments and that Medisave cannot be used for things like out-patient treatment other than the approved list of chronic illnesses, etc). For those who cannot pay, they can apply for Medifund in theory. However, as we understand it, in order to get Medifund to pay the entire bill, the patient must be in Class C, all family members’ Medisave must be wiped out, he/she cannot be staying in a private property, cannot have more than a few thousand dollars in the bank, etc. However, for the people in the Nordic countries, they do not need to pay hefty healthcare bills. The governments in the Nordic countries provide very heavily subsidised bills. Also, in these countries, there is only a cap, or maximum amount that the citizens need to pay for healthcare. The Danish get healthcare for free. Norwegians only need to pay a maximum of $407 every year. For the Swedes, this is $518 and for the Finns, the maximum they need to pay is $1,022. So, after deducting for healthcare, what do we get? You would remember that for the Singaporean, he/she had only $1,630 left previously. And because he/she would still need to fork out $1,000 in cash for his medical bills, the Singaporean is thus left with a surplus of $630. In other words, a Singaporean low-wage worker would have very little left. However, for the citizens in the Nordic countries, they would still be in good financial health (Chart 7). Finally, on education – assuming the Singaporean has two children, one in university and one in a polytechnic. The lowest university course fees are $7,650 and the lowest for a polytechnic course is $2,300. Assuming the children are able to receive bursaries, the polytechnic student would still need to pay about 20% of the fees. Also, the parent would still need to pay the non-tuition expenses of say about $2,000 in a year for their education. However, in the Nordic countries, education is free. As such, in the Nordic countries, parents do not have to spend anymore for their children’s education, or even for their own further education. Thus finally, what you would see is that after deducting for tax, social security (CPF) and the essential spending on basic services, citizens who work as cleaners in the Nordic countries would be able to save between $7,846 and $24,676 in a year. However, for a Singaporean, he/she would go into a debt of $1,370 (Chart 8). This means that for a Singaporean on low-income, he/she has two options. Either they take on loans and go into further debt, or they would have to choose to forgo seeking treatment for their medical condition, and they might not be able to put their children through higher education. Thus, even though tax is low in Singapore, does it actually benefit Singaporeans, especially low-wage Singaporeans? For citizens in the Nordic countries, they receive next to free healthcare and free education. Thus if they fall ill or would like to further upgrade themselves by studying, they can do so with ease of mind. However, for a Singaporean, the debt burden would put them off these pursuits. They would end up being sicker and their health condition might worsen. And if their children are not able to go to universities or polytechnics, they would remain poor. Thus, the question is – would paying higher taxes and receiving free healthcare and education be worth it? The answer seems to be a yes, from the example of the Nordic countries. However, you might ask – but what about someone who earns a higher income? We had also looked at the wages of bus drivers, and compared them with that of the Nordic countries. 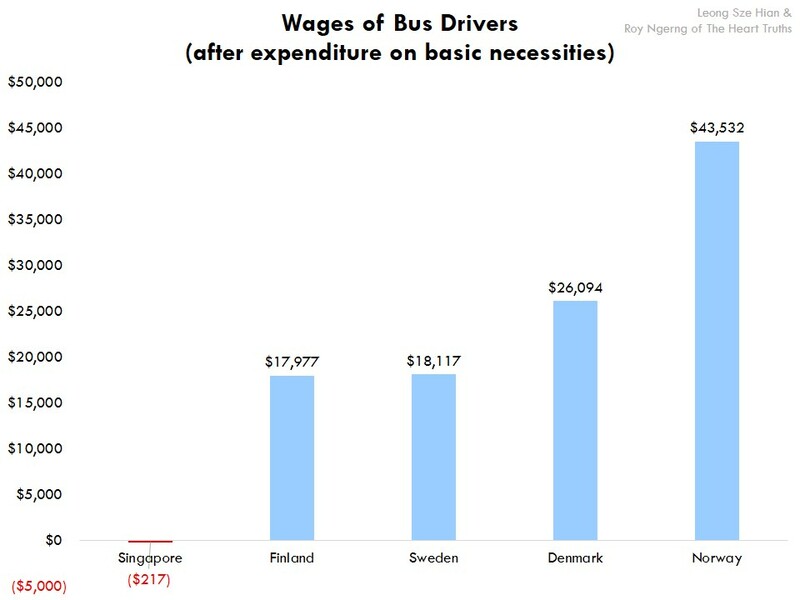 You can see the wages of the bus drivers in the different countries in Chart 9. For the Singaporean, he/she would earn $1,800. The difference in calculation would be that instead of spending $10 everyday on food, a bus driver in Singapore might be able to spend $15 on food. For housing, he/she wouldn’t be able to apply for subsidised rental flats with the HDB, and would pay about $650 to rent a flat. After deducting for the expenses, a Singaporean who earns $1,800 would still go into a debt of $217, whereas counterparts in the Nordic countries would still be able to save between $17,977 and $43,532 in a year (Chart 10). Now, consider this – if a Singaporean who earns $1,800 would still go into debt, this means that about 35% of the population cannot save, and are not paid enough wages to do so! But, how much must a Singaporean earn in order not to have to go into debt, and barely survive? Thus you see, the governments in the Nordic countries are paying their workers a wage that is commensurate to the cost of living in their countries. We had previously written about how Singapore is the 6th costliest city to live in, in the world, whereas all the capital cities in the Nordic countries are cheaper to live in. Oslo, Norway is 18th most expensive, Copenhagen, Denmark is 21st; Stockholm, Sweden is 46th and Helsinki, Finland is 65th. As such, if their citizens are earning higher wages, shouldn’t Singaporeans be earning higher wages as well, and even higher wages than them since our cost of living is even higher? Not only that, because the governments in the Nordic countries collects more tax and redistributes them, for the poor in these countries, they are able to continue to access basic services and yet, be able to save as well. This is a luxury that the poor in Singapore cannot afford. Instead, the poor in Singapore has to suffer from poor health and lost educational opportunities. In the next part of the article, we will share with you how much of the share of income in Singapore the poorest 80% of Singaporeans have, and how much the share of income the richest 20% hold. What you will find out might shock you even further. 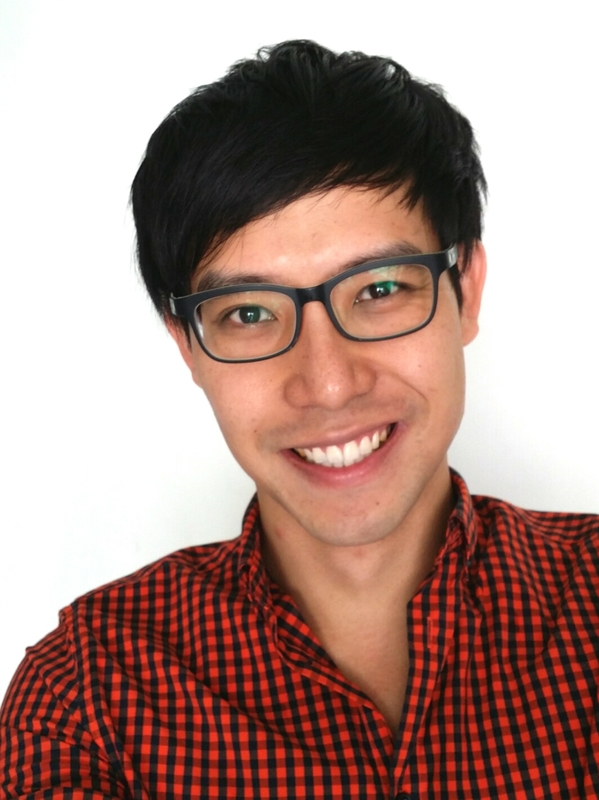 Written by Roy Ngerng Posted in How Much Tax Are Singaporeans Really Paying? The article is well thought and written and the assumption are realistic. However, for housing, if a Singaporean buys a HDB flat, the monthly payment would be from the CPF which you had already deducted form his salary. Wouldn’t this be double counting? For food, if you are assuming a family with 2 children, then definitely $10 (cleaner) and $15 (bus driver) per day would be insufficient. You need to add in a miscellaneous expenses for clothes, barber, visit to Poly Clinic, bath soap, shampoo, electricity & water etc. Hey, while you are at it, can do a comparison on the ministers and contrast it with the cleaners. Yo sexispider. Paris, Tokyo, Helsinki, monte carlow, St barts, ibiza, new York, Washington, Dubai, the Hague, Saint Micheal, Los Angeles, Milan, are.just sone of the.cities which are much more.expensive than singapore. Have you travelled? Singapore has the most expensive housing, cars and tertiary education, and the highest out-of-pocket health expenditure among the high-income countries. Expensive housing? Oh Roy, but are many people living in the streets? Most have.homes? Most newly.married couple.can.afford to.buy a new flat. No? Cars? No arguments. We are the most expensive. ‘out of the pocket’ health care? Do get coverage, thru.both govt and private insurance. Let’s see how long you need to book in advance to see a doc in whatever country you think it’s.’cheaper’. 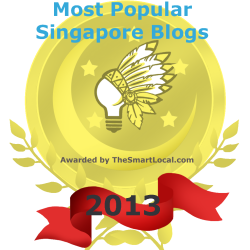 I find the titles “How Much Tax Are Singaporeans Really Paying?” and “Where is our money? 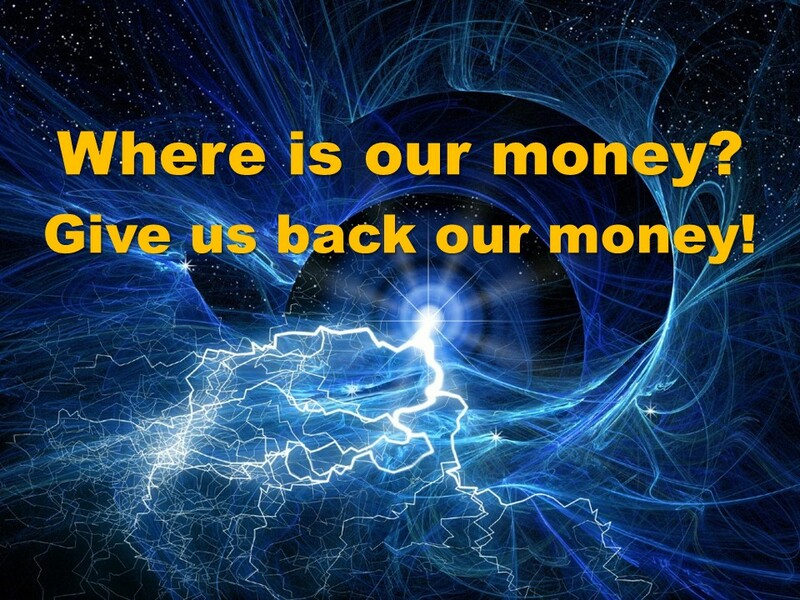 Give us back our money!” misleading. The article asks, “…for the poor in Singapore, are they really paying the lowest taxes?” the answer is still a Yes to me after reading the article. It is not that the unskilled workers in Singapore are paying too much taxes, but they are just not paid high enough in comparison. 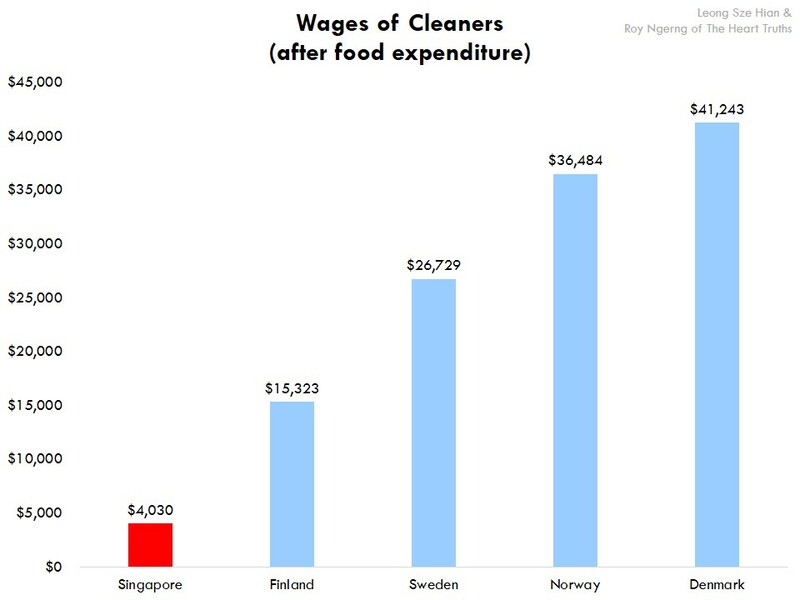 Notice that the S$24,676 that a Cleaner in Denmark is left with AFTER all expenditures (Chart 8) is still way higher than the gross wage of S$9,600 of a Clean in Singapore BEFORE all taxes, CPF, food, transport, housing, healthcare and education (Chart 1). There is no way that a Cleaner in Singapore can be better off even if the Government provided for everything, for free. The article highlights issues that are more fundamental than how much the poor in Singapore are paying in taxes or other costs of living – namely our productivity as a workforce. The article does point out a widening income gap problem that Singapore is facing. The Government is now trying to narrow it through limiting the supply of cheap foreign workers as we know. But for our unskilled workers to be paid higher in a sustainable way, we need to be more productive overall as an economy. There is no two way about it. To Roy, it’s easy. Just wave a magic wand ala harry porter. Ha… that’s a troll without a brain. Please lah. You know #freemyinternet? What are you trying to do? A parent is worried about his child future prospect in the competitive job market and decides to send him for tuition. Would you analyze to say if the parent spends $X on tuition fee, the child should be expected to land with a job $Y higher? When he did not manage, fault the parent for making a wrong decision. Shouldn’t the child be grateful that the parent is spending and try his very best to benefit from the tuition instead? Or do you prefer a parent that does nothing, like many other parents in the neighborhood? When the child is not able to get a high paying job eventually, are you going to demand the parent to top up with his pay with pocket money, just because the parent can afford it, so that he can be comparable with his peers (in the Nordic)? I agree with you that the problem lies in income gap, not tax per se. But productivity is just a strawman excuse. You mean cleaners in Norway can clean 8 times more blocks of flats than cleaners in Singapore? There is only so much you can do with the aid of technology, but not that much. This is where a common misconception lies. To narrow the income gap, we do not need Singapore cleaners to be more productive proportionately. The productivity gain has to be more broad based, contributed by other skilled workers, corporate and country as a whole, for companies to be able to afford paying their cleaners, performing more or less the same job, a significantly higher pay, i.e. closing income gap. 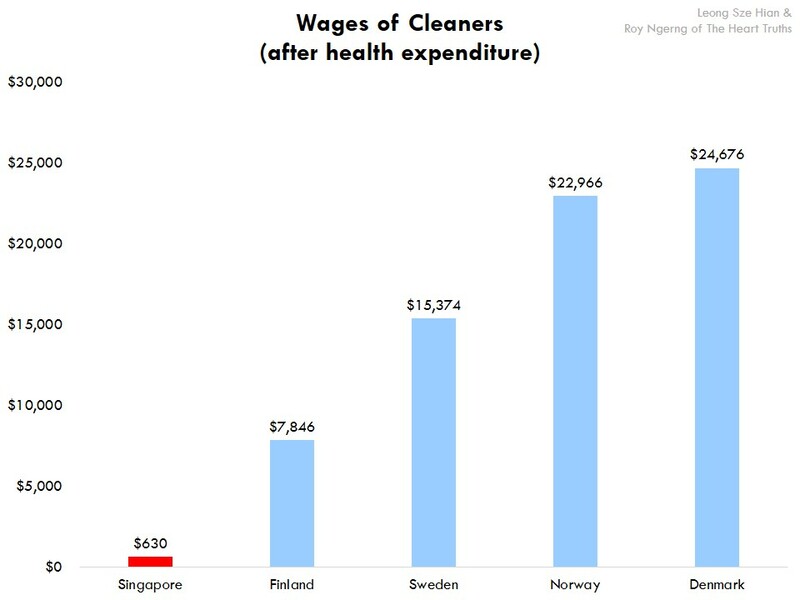 Can you imagine what it will take for Singapore companies to be able to afford paying its cleaners S$5,502 a month like in countries like Denmark, from the current S$800? Government’s coffer comes from the people ultimately. I say we start looking at upgrading of the workforce’s and company’s productivity. I applaud some Singaporeans spending hours writing “power packed” articles – they do so because they care. But if only these efforts could be transformed into positive energy and applied in constructive way, such as to propose what Singapore should do to get there. So if the problem does not lie with the cleaner, does it lie with the CEOs and ministers? How productive could these people be when those below them are considered unproductive? And why are they earning 8 times more than those at Norway? Couldn’t be that their workers are cleaning 8 times more effectively than those at Norway since they are not productive? So what productivity are we talking about? Isn’t this just a strawman excuse? Solution? What do you think since you are asking. Don’t keep harping over cleaner’s productivity (no thanks to Prof Koh). We cannot reasonably expect a cleaner to double his output beyond what’s humanly possible to deserve a higher wage. To pay a cleaner a higher wage, part of the output has to come from somewhere else. Can the government legislate to say all companies shall pay its cleaners a minimum of $5,502 starting from tomorrow? Yes, maybe. But should it? No! But let suppose most Singapore companies became the likes of Apple, Microsoft, Google or Samsung overnight. Do we still need the cleaners to be more productive to pay them S$5,502 a month? Anytime, I say. It is national productivity we are talking about. The challenge is how to restructure our economy to get there. We can only rely on the Government to set the right policies, create the right environment, provide assistance to companies and its workers to upgrade themselves, such as to employ technology, in skills, innovation, etc. The rest is up to us – the workforce – really. To pay a cleaner a higher wage, part of the output has to come from somewhere else. Where? From who? Do you think this is a constructive or naive suggestion? Think. Think. Can the government legislate to say all companies shall pay its cleaners a minimum of $5,502 starting from tomorrow? Let’s not go into that. Why is there a wage gap? Is it due to the government legislating a wage gap? If not, what is causing the wage gap? I put out to you that this is the direct result of large supply of cheap labour from blue collared all the way to PME level. Supply and demand naturally means that the wage of rank and file workers would be suppressed. But let suppose most Singapore companies became the likes of Apple, Microsoft, Google or Samsung overnight. You are drifting out of point here. We can only rely on the Government to set the right policies, create the right environment, provide assistance to companies and its workers to upgrade themselves, such as to employ technology, in skills, innovation, etc. There you go again with your strawman excuse. What technology, what assistance? You write like you know a lot, but actually quite empty rhetoric. Heard that umpteen times. Is that a constructive and workable solution that would reduce the income gap? Or would the trickle down effect produce a wider gap no matter what “right” environment and what “assistance” provided? Think. 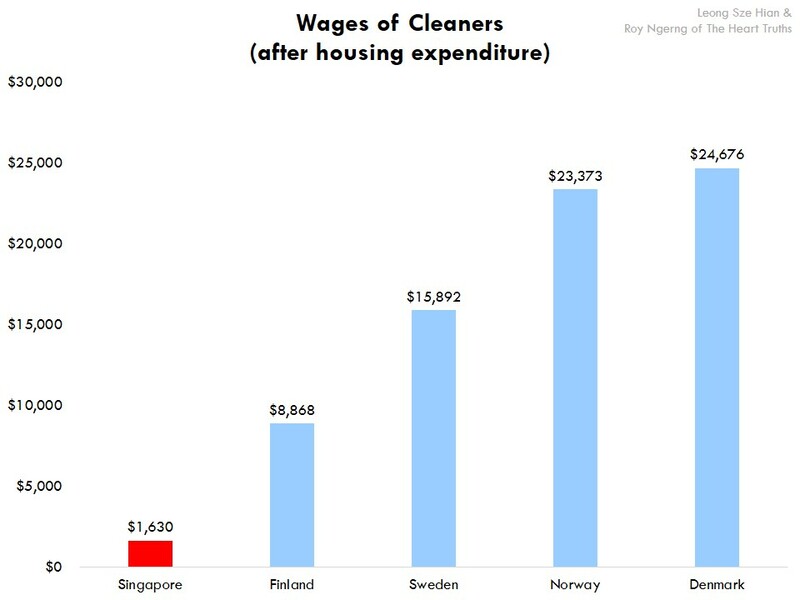 You mean cleaners in Norway can clean 8 times more blocks of flats than cleaners in Singapore? What kind of skills do you need to clean a block of flats. The skills to hold a broom, the skills to operate a vacuum cleaner? What more skills could a cleaner learn? What assistance do you think they need in order to clean more effectively? What courses do you suggest these cleaners take? Why do cleaning companies in Norway pay 8 times more for their cleaners without assistance from the government? Why ministers here can earn 8 times more than those in Norway without the country being 8 times more productive than Norway? Is it your mind that refuses to see what I am pointing out clearly to you? Will deal with your questions in the next parts. More than enough money to increase wages of workers in Singapore. Hey relax Bro! If you don’t get it by now, it’s unlikely you will ever get it..
Bro, just trying to wake you up. Not that I don’t get it, just that you don’t know what you are talking about. Keep spewing empty rhetoric.. Can’t face the hearttruths? I say from the bottom of my heart as one who cares about Singapore’s future. Not sure about you. Now at least Roy is getting it! Surely there’s is enough money for companies to increase workers’ wages initially when foreign labour is tightened. But the question is by how much and how to keep it sustainable? Say due to a tightened labour market, we see a 10% increase in cleaner’s wages (to S$10,560) in the first quarter, then another 10% increase (to S$11,616) in Q2.. or an increase of 46.4% (to S$14,055) by the end of the first year. 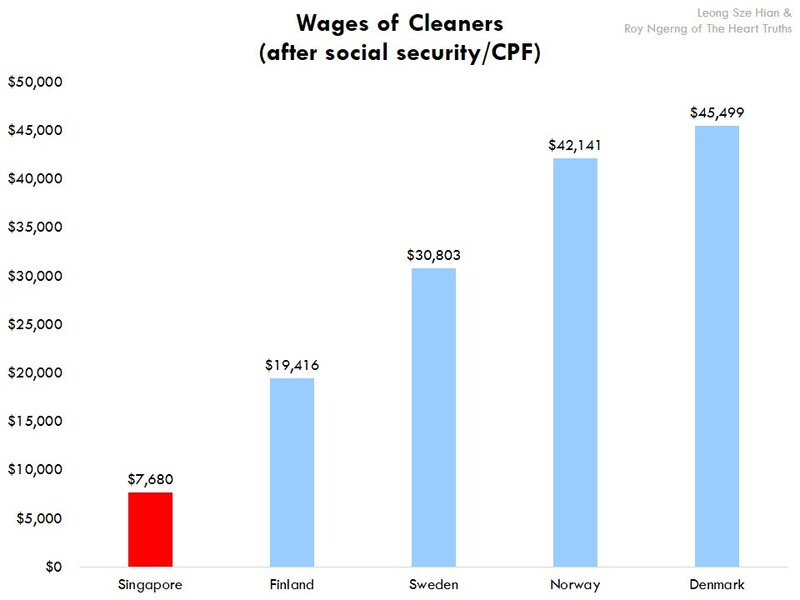 By the end of the 5th year, the cleaner would be drawing S$64,584 a year, not far from their counterparts in Denmark. Hurray! We know higher productivity is just empty rhetoric. Companies should just continue to generate the same output with the same number of workers over the 5 years. So how are Companies going to afford the aggressive wage growth? Easy, cut the COE’s pay of course! Not enough? Cut the PME’s wage next. Now we have finally become an egalitarian country. Bravo! But would the Companies still be around? Companies in the Nordic countries and Europe are still around. And they have the lowest CEO to worker salary ratio. All the arguments about companies not being around when MCE can be over budget by 1,800,000,000. Finally you are getting it. Cut the CEO’s pay to up the cleaner’s pay. Make them same pay what Norway is paying for these two groups. And don’t worry, as Roy pointed out clearly to you, Norway is still around! And companies are still providing cleaning services. How to do that, very simple two step solution. 1) Cut the cheap foreign labour supply. 2) Empower the workers by letting them form unions to bargain for their fair share of wages. Government need not legislate what companies should pay as supply and demand will naturally rebalance the current imbalance. But why isn’t that happening? Because the pro-business PAP government is the stumbling block. It allows cheap labour to flow freely with a very loose foreign worker dependency ratio coupled with loose S-pass and employment pass conditions, allowing companies to hire predominantly cheap foreign workers or PME in virtually every company. Second, PAP makes it illegal to form unions except for its endorsed NTUC that does nothing to protect Singaporean workers. What a great idea! …and vote in which party? Which NON pro-business party should we vote in so that I can get my share of the money accumulated by the pro-business PAP? I am anxious to get my Nordic pay! And I say from the bottom of my heart as one who cares about Singapore’s future. Interesting that you compare papigs to parents. In life, who else can a spoiled brat throw their tantrum to and still get their way? So sexispider, do you suggest Cpf be abolished? It is incorrect to assume that Norwegian cleaners spend 18 % of their income on housing. 18 % is the amount spend by ave Norwegian income earners, and not in particularly norwegian cleaners. if we work backwards using 18 %,a Norwegian clearner would have to pay $ 11884 per year on housing. That is 10 times more that what a Singapore cleaner has to pay according figures in chart 6.
can CPF rates be use as a comparison with social security rates of other countries? CPF rates can be summarise as savings rate, in certain way, the higher the better for the individual in LR. Singapore’s social security rate is ZERO. I’m a Singaporean living im Scandinavia. From just my observation, life is difinitely way better for the low income earners here than in Sg. Singapore is not really a country, it’s more like a corporation and the people are just taken advantage of and exploited. It’s sad to see that this is the country I’m from but I’m glad I’m not living there anymore. At the end of the day, people have to fight for what they want and Singaporeans are just not fighters! Hi. Where are you staying? I was staying in several European cities for several years. Thrown out of several European cities more likely. Lol. That’s very cheeky for someone who wants to make singapore for the better. Who are the ‘some people’? That’s a very irresponsible statement you made against an ordinary singaporean. How.can I.be possibly be thrown out by several European countries? You heard of the Eu? Than go jolovan to.complaint to un? Has anyone checked on the amount of money the government collects from foreign worker levies from blue collar to PMEs to maids. I would be surprised if this is not substantial. On another note, randomly, I met with 3 local SME owners, a trading business, a metal fabricating business and a M&E contractor, all of them are my business partners. All 3 had the same comments on doing business in Singapore and that the government is not supportive of local enterprises. Very expensive due to foreign worker levies – $700 per month paid to government for each worker. Government tenders will always favour large foreign consortium (Japanese, Chinese, Korea) and local players will have to be sub contractors and take the smaller pieces of work from these foreign companies. I find this feedback disturbing and dangerous because this shows the government is really not in touch with the citizens. What Kind Of Education System Do Singaporeans Want To See?